Above: Tristan Al-Haddad's "Nimbus." Photo by David Joles for the Star Tribune. 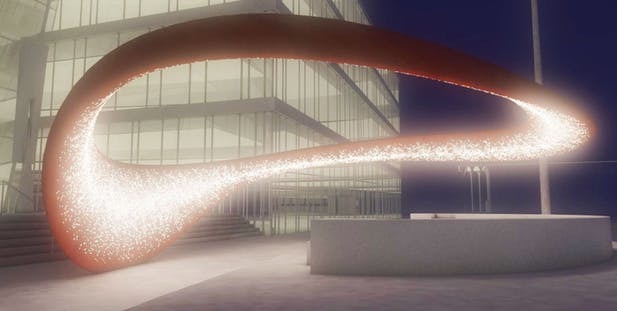 Artist Tristan Al-Haddad’s long-awaited sculpture “Nimbus,” which resembles a curved airplane wing, will be gently lifted into place above Nicollet Mall’s Theater in the Round in front of the Minneapolis Central Library (300 Nicollet Mall). The installation begins this Saturday at 10 a.m. Visitors are invited to witness a crane cantilever the piece above the ground, where it will stay. The installation will last for two hours. After that, Al-Haddad and his team will spend the rest of the day welding “Nimbus” to its permanent foundation. The weather is expected to be sunny, with temperatures in the low 20s. The process of building “Nimbus,” Nicollet Mall’s now-largest sculpture, was anything but smooth. It was supposed to be installed last spring, but a shortage of able workers led to a delay. Atlanta-based Al-Haddad ended up working with the Minneapolis-based welder Seven Bailey, who is also an instructor at Dunwoody College of Technology. Cold weather also contributed to the delayed installation. The 45-foot-wide curved structure will be anchored to one side of an 80,000-pound concrete footing deep below the sidewalk. When complete, colored light will beam through its skin, offering those who sit underneath it a truly spectacular, very lit experience.